Do you drive an older car without an automatic "lights-on" warning circuit? If so, you've probably accidentally left the lights on and flattened the battery on one or more occasions. 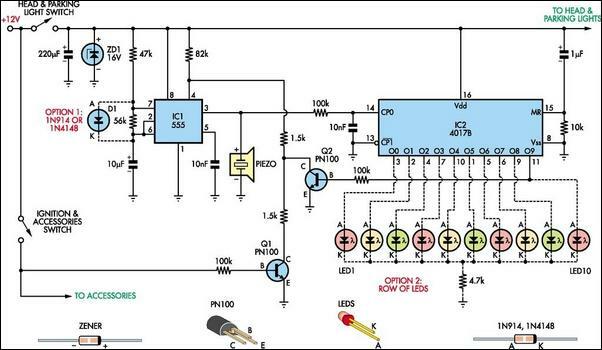 This headlights reminder circuit will prevent that. It's more complicated than other circuits but it's also more versatile. As shown, the circuit uses two low-cost ICs. IC1 is a 555 timer which is wired to operate in astable mode. Its output clocks IC2, a 4017B decade counter. IC2 in turn drives a row of indicator LEDs and also resets IC1 (after about 10s) via transistor Q2. when the ignition is on, transistor Q1 is also on and this pulls pin 4 of IC1 low. As a result, IC1 is held reset and no clock pulses are fed to IC2. Conversely, if the ignition is turned off, Q1 will turn off and so IC1 will start oscillating and sound the piezo siren. At the same time, IC1 will clock IC2 and so LEDs 1-10 will light in sequence and stop (after about 10s) with the last LED (LED10) remaining on. That's because, when IC2's O9 output (ie, pin 11) goes high, Q2 also turns on and this pulls pin 4 of IC1 low, thus stopping the oscillator (and the siren). That different colored LEDs are used to make the display look eye-catching but you make all LEDs the same color if you wish. Installing optional diode D1 will alter IC1's frequency and this will alter the display rate. Finally, if the lights are turned off and then back on again, the alarm will automatically retrigger. LED1 is always on if the lights are turned on. If you don't want the LED display, just leave the LEDs out.